The venerable broadcast system of days gone by has re-emerged on our website for all to hear and enjoy. Those of our readers that have been around for a while will recall that Radio Molossia first debuted around five years ago. At that time, our online station largely played only music from the 1980's, sprinkled with humorous sound bytes. We published around fifteen episodes of Radio Molossia before technical difficulties forced the closure of the station. Efforts to restart the "broadcasts" were subsequently stalled by continued technical difficulties and were eventually abandoned. We are pleased to announce that our technical problems have been solved, and Radio Molossia is back and better than before. 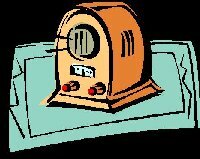 In addition to music, the new Radio Molossia also features current news from our nation and short radio shows, all in keeping with the theme of 1920's - 1930's radio, the Golden Age of the medium. While our station's music may not be in line with more modern music, it is certainly not outdated and we are positive that even the most critical listeners will enjoy it. Radio Molossia is presented in steaming MP3 format, and is also available for download. So turn your dial over to Radio Molossia and enjoy! Radio Molossia is located here.